The literary magazine Dietsche Warande & Belfort, under the patronage of Cera, made 17 booklets in which the cross-over between art and literature creates a unique form. A productive dialogue between artists and authors led to exciting portfolio’s in which the limits of each discipline are challenged. The work shown in ‘Bestuifbegeerte’ consists mainly of drawings, photographs and video work, interacting with an audio-installation with 64 new words of Peter Verhelst, forming the leitmotif throughout the exhibition. 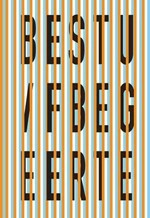 These new words equally accompany this publication, which was made on the occasion of the exhibition ‘Bestuifbegeerte’ at Z33 in Hasselt, 2003.